CHIEF CONCERN: Hun School football head coach David Dudeck, center, rallies his players last Friday during Huns season opener against visiting Episcopal Academy (Pa.). 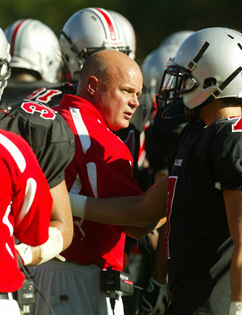 Dudeck, who was named as the Borough police chief last December, guided the Raiders to a 21-20 overtime triumph. For more details on the game, see page 39. As of Tuesday morning, the Princeton Public Library had raised $9.5 million for the launch of its first-ever endowment fund. Director Leslie Burger mentioned the news to a gathering of the Princeton Merchants Association, adding that since the goal is $10 million, staff at the library would be seeking $25,000 from donors every day for the next 20 days so that the target could be met in time for the librarys centennial celebration on October 10. In their annual reports to Borough Council last week, the Executive Directors of both the Princeton Senior Resource Center (PSRC) and Princeton Community Housing (PCH) cited the need for better transportation opportunities around town, particularly for senior citizens. During the meeting Councilman Roger Martindell advocated strategies for dealing with the effects and results of the recent revaluation. As for 2010, its a done deal, said Mercer County Tax Administrator Martin Guhl at a Township Committee work session on revaluation issues held on Monday. What did people do before they could call 911 if something went wrong? How were fires fought at the turn of last century? How do you make bandages? If you ask people whove just read a story, well, how did you like it? youll just get inanities, said People and Stories/Gente y Cuentos founder Sarah Hirschman in a recent interview. Contrary to recent rumors, Chicklet Books, the three-year-old fun and funky book boutique based in the Princeton Shopping Center, is alive and well and has no intention of closing. Ditto the post office sub station in the store. Although Alli Salazar is going through an adjustment process in moving to sweeper this fall for the Princeton High girls soccer team, she received a good tutorial on the position last season.